Look out for TOC’s National Day special from August 1st. Our writers share their personal take on each sentence of the National Pledge. 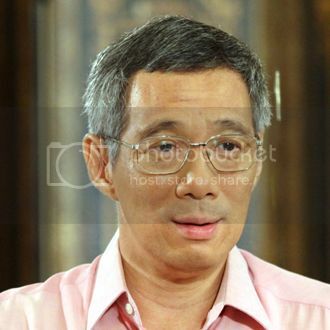 That was what Prime Minister Lee Hsien Long said in August 2008 when he announced the relaxation of the rules for public demonstrations at Speakers’ Corner. The new rules came into effect on 1st September 2008. Singaporeans who wanted to hold public demonstrations at the park no longer had to apply for a police permit to do so. With such assurances by the Prime Minister and the Home Affairs Minister, one must wonder why there are now five closed-circuit televisions (CCTV) at Hong Lim Park. Coming on the heels of the recent spate of new rules such as the amendments to the Films Act and the introduction of a new Public Order Act, Singaporeans are wondering if political space is being curbed, instead of being opened up, which was what the Prime Minister had promised. 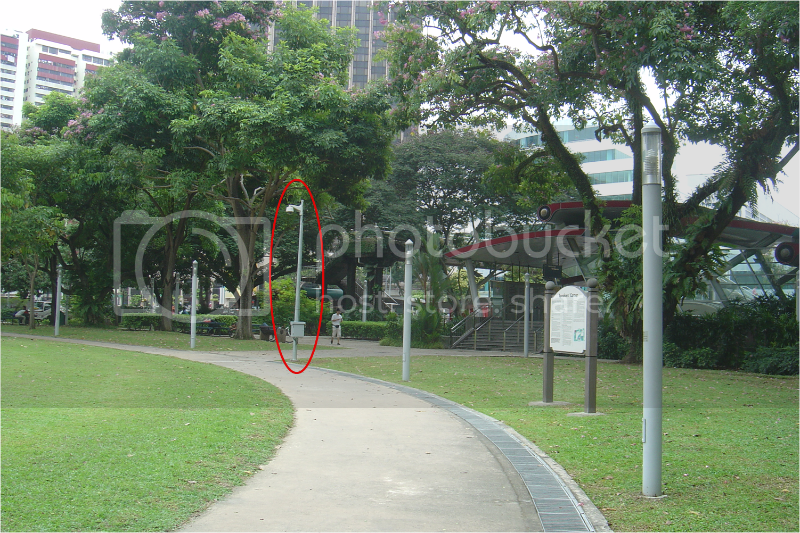 When I visited Speakers’ Corner on Friday, 24 July, there were three cameras mounted along the perimeter of the field – one just outside the entrance to Clark Quay MRT station, a second near the Kreta Ayer Police Station and the third just in front of the stage. All three face the open field. 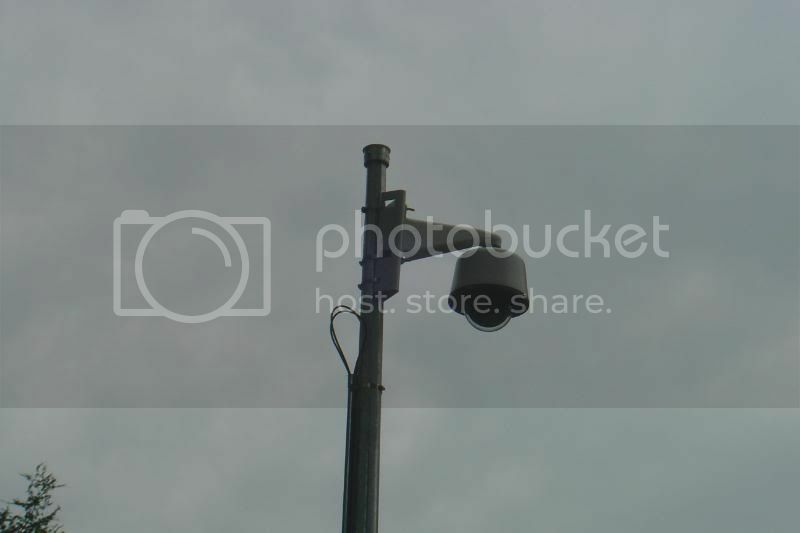 A fourth one is located near the car park and the fifth mounted on the external wall of the police station, facing the park. Why is there a need to have five security cameras at a relatively small area? To find out the reasons, I visited the Kreta Ayer police station, which is located beside the park. The officer there told me he knows nothing about the cameras, except the one mounted on the police station building. I asked him who monitors the cameras. He said the park is under the charge of the National Parks Board (Nparks) and gave me a number to call them. So I did. A few questions naturally arise. So clearly, the police’s reasons for installing the CCTVs – “safety and security” – are at best dubious ones. Surely, the crime rate there could not have suddenly spiraled since April, which is just three months ago, when Ms Ng made her remarks. 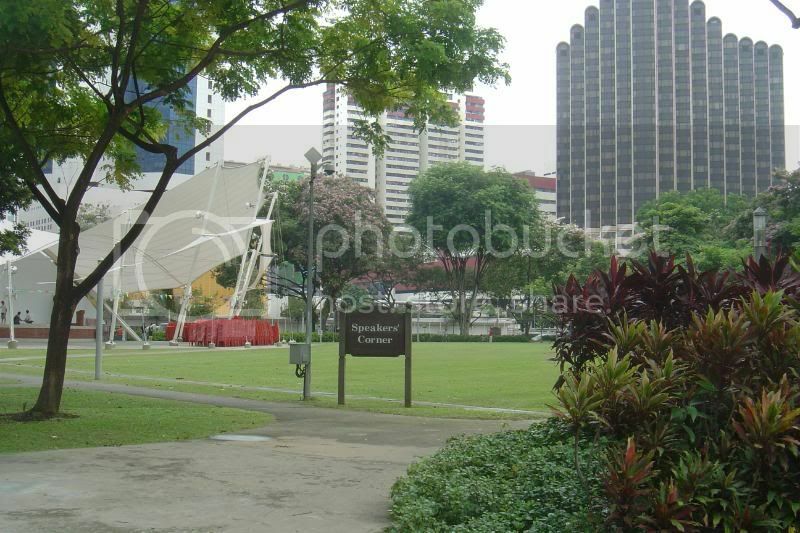 Besides, Hong Lim Park has also been rather quiet the last three months. So, the police’s fear of “safety and security” does not stand either. In any case, isn’t it strange that the police officers at the Kreta Ayer police station, which is virtually within the park itself, do not even know about the CCTVs? Two, the police’s statement is interesting to note. It said, “CCTVs are used to complement police presence on the ground and to project a greater sense of security.” Notice that the police does not say the cameras are to provide a greater sense of security but only to “project” it. Put another way, the cameras are for deterrence. The question is: Who are the police trying to deter? There is no evidence of any significant presence of crime at the park. So, criminals cannot be the target. Are the cameras suppose to deter activists, as some have suggested? Yet, why would the police want to do this? Isn’t Speakers’ Corner supposed to be a free space where demonstrations are even allowed now? Three, does not the police feel that the presence of the cameras would instead be contradicting the promises of the Prime Minister, who said that “there is no need for the police to get involved”? Perhaps the government did not expect huge crowds to turn up for events at Speakers’ Corner and thus was caught by surprise. Hence, this back-peddling and the presence of the five cameras. Crowds as large as 1,000 people turned up to protest their predicament during the structured products saga last year. More recently, 700 people showed up for the Pink Dot event, organized by the gay community in Singapore. By local standards, these crowds are huge. Perhaps the government should not be alarmed that more Singaporeans are now willing to participate in such events. They should be encouraged and not curtailed – or seen to be curtailed. This has been what our ministers have been urging Singaporeans to do – to get involved, to speak up, and so on. The PM even called on Singaporeans to “mobilize” themselves. “Singapore’s political and social climate needs to give space for more ventilation and variation. “Lee Hsien Loong’s government is not freeing up political space. They are calibrating it so that they [can] better manage it,” he added. Former Nominated Member of Parliament, Mr Siew Kum Hong, called the presence of the cameras “ridiculous”. Indeed, it seems they don’t.